Well, 47 days have passed since our last Project Pink Day posting. Oops! To be honest it has been some of the craziest 47 days of our lives. Last time we posted it was about our Visitor Extravaganza and leaving our beach home for fun with friends in Orlando. Now I’m writing to you from our new home in Breckenridge, Colorado. But, there is a lot that has gone on to get us to this point. As I began recounting our journey it got quite long, so here’s the plan. THIS posting is the short(er) version of our adventures the last month and a half. If you want the long version of any story you can always click the links for more. Fair warning: the Disney post could stand alone as its own guidebook! Our first stop after Ft Myers Beach was a week long vacation in the Orlando area. 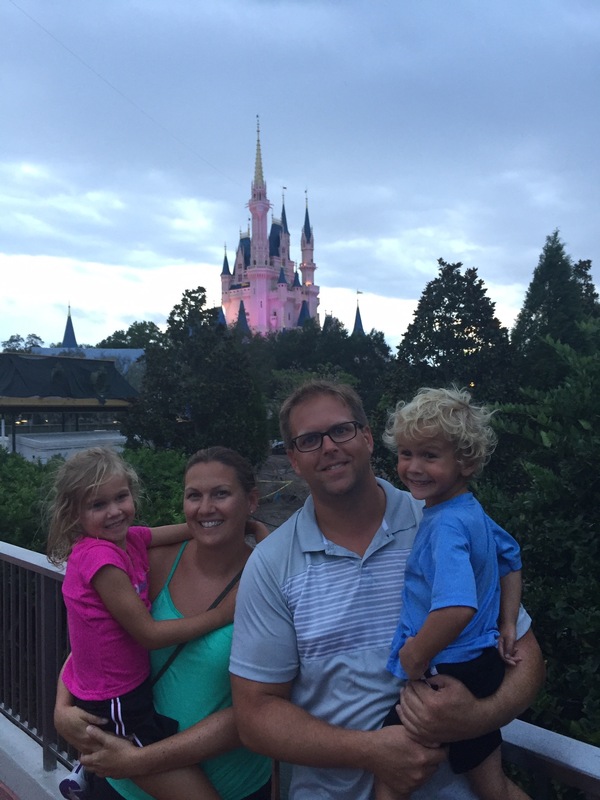 We hit up SeaWorld and Disney World with our good friends Richie, Katy and their two kids – Chloe and Ollie. Day 1 was at SeaWorld – yes, we’ve seen Black Fish. The kids loved the shows – dolphins, sealions, killer whales – and the kiddie rides. The parents loved the rollercoasters, especially Manta! We spent 3 days at Disney World – two at Magic Kingdom and one at Hollywood Studios. Thanks to Kelly’s summer long preparation, the week was filled with beating the system with Fast Passes to avoid long lines for the rides, character lunches for the kids to meet their favorite Disney stars, and parades to see dragons, hear great music, watch fireworks and see even more of their favorite characters. And, we didn’t die of heat exhaustion in 90 degree + 90% humidity thanks to a bit of rain (gotta love those ponchos!). It also helped that we downed gallons of water and wore our “fancy” cooling shirts from Columbia. It was an unbelievable experience for both families. We can honestly say we rocked SeaWorld and Disney World and we’ll be back – in like 5 years. If you want to know more about what we were able to do, you can click on the full blog post Living it up at SeaWorld and Disney World. The second phase of our two weeks with Richie and Katy was at Madeira Beach near Tampa. Unfortunately, the beach “welcomed” us with rain, wind and 7 foot waves. After sticking it out on Sunday (during Kelly’s birthday), we decided to head south back to Ft Myers Beach where we knew the area and the forecast was much better. Luckily we did! We were rewarded with two perfect, hot, sunny beach days and got to show our friends our old stomping grounds. For us it was a nice final goodbye to the place we’d called home for the summer. If you want more details, you can get it all at our Back to the Beach post. On Saturday, August 8th we said goodbye to our friends and loaded up “White Shadow” (our SUV) for our road trip to Colorado. It was 3 months to the day since we arrived in Florida and it was time for our next pink day adventure! Now, the “short” way to drive from Madeira Beach to Denver would be 1,883 miles. However, we decided to visit friends in Austin, Texas along the way, which added a few hundred miles to what would already be a week long journey. We planned to break up the long drive into a few chunks. In the end we went from Madeira Beach to Gulfport, Mississippi our first day. Not as far as we’d hoped, but monsoon-like rain in both Florida and Mississippi slowed us down. The next day we made it to Austin to visit with our friends Tim, Andrea and their four kids – Claire, Oliver, Fiona and Alistair for a couple of days. We had a fun time watching the kids play together, enjoying delicious food, relaxing by their pool and catching up with each other. Kelly and I decided to push it and drive direct from Austin, Texas all the way to my brother Dustin’s place in Denver in one day. The trip ended up taking a solid 14 hours, but we’d made it – we were in Colorado! 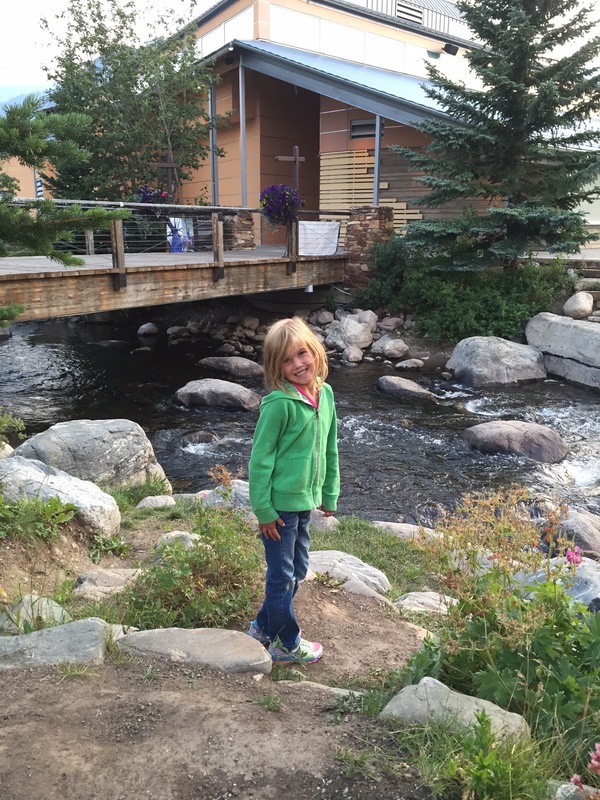 After a couple of days acclimating to the altitude and visiting with family, we headed up to Breckenridge. As we drove, we were looking forward to seeing the kids reaction to the big peaks, driving through long tunnels and seeing snow on tops of the mountains. Well, we didn’t get any of that because they both fell asleep!!! We couldn’t blame them. It had been a long adventure up to this point. 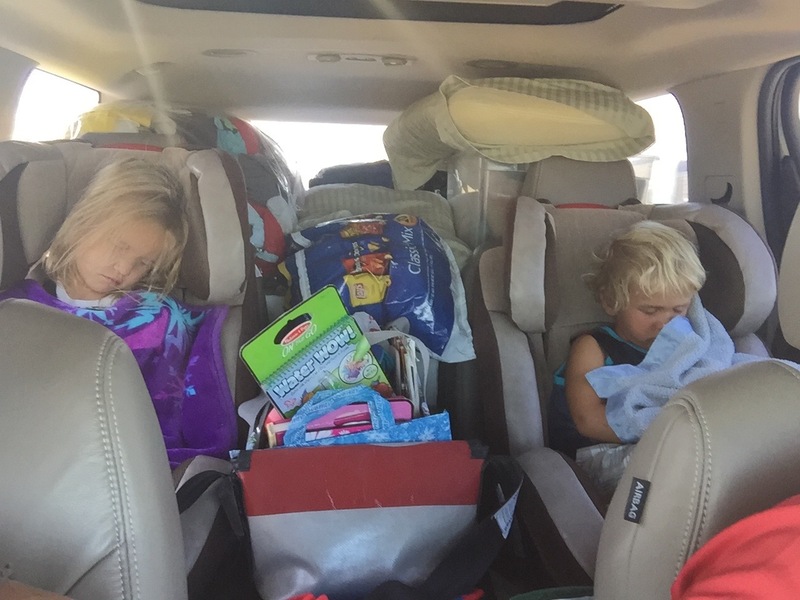 We were all tired, but as we pulled into Breckenridge – we were home. For more on our road trip, check out the post Our Road Trip to Colorado – the long way. What I’ve failed to mention thus far is that once we arrived in Breck, we really didn’t have a place to call home yet. Turns out the place we’d planned on renting was no longer an option and we found this out on our last day in Ft Myers Beach – AHHH! So during our travels from Ft Myers Beach until we arrived in Breck – we had no long-term rental finalized. Luckily we found the perfect place just a couple blocks from our original location. The catch was we couldn’t move in until September 1st. So, we stayed in our original place short-term until that day would come. That aside, we had a great intro to our new town. There was the Breckenridge International Festival of Arts (BIFA) going on with live bands, blue painted trees and artwork, of course. We also watched the bike race – USA Pro Challenge – roll through Main Street. We entered ducks in the Great Rubber Duck Race and cheered them on. Kelly and I even got to go to the Breckenridge Beer Fest with my brother Dustin – who let us stay longer than expected as he went back to watch kids… thanks Bro! And that was just the events – we also did gondola rides, alpine slides, a few different hikes, met new friends on playdates with the kids, and more. 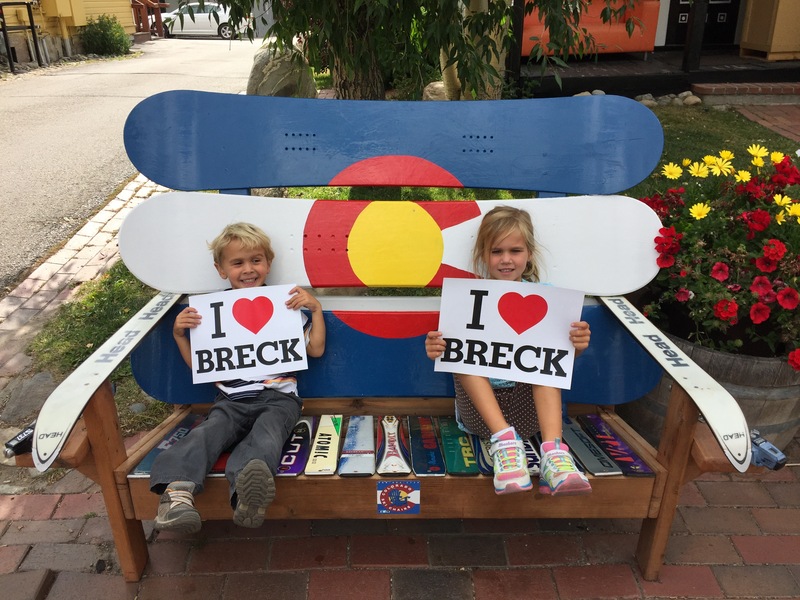 If you want all the details you can read the full Our First Few Weeks in Breck blog post. Well, there you have it – the (somewhat) short version of how we came to be residents of Breckenridge. Hopefully we’ll find more time to blog about our adventures and learnings along the way – and a bit more frequent than every 47 days!